The topic of managing millennials is becoming an issue across nearly every major industry. However, the call center industry has been particularly affected by unmotivated and disengaged millennials. So, where do you start to fix this industry wide issue? A detailed explanation of the importance of company culture...and how your call center can proactively maintain an abundantly empowered atmosphere. How to reduce high millennial agent turnover rates? How to ensure company goals are always being met? Nima Hakimi & Dr. Gustavo have employed thousands of millennials throughout their professional careers within SMB to enterprise-level B2B and B2C call center operations. 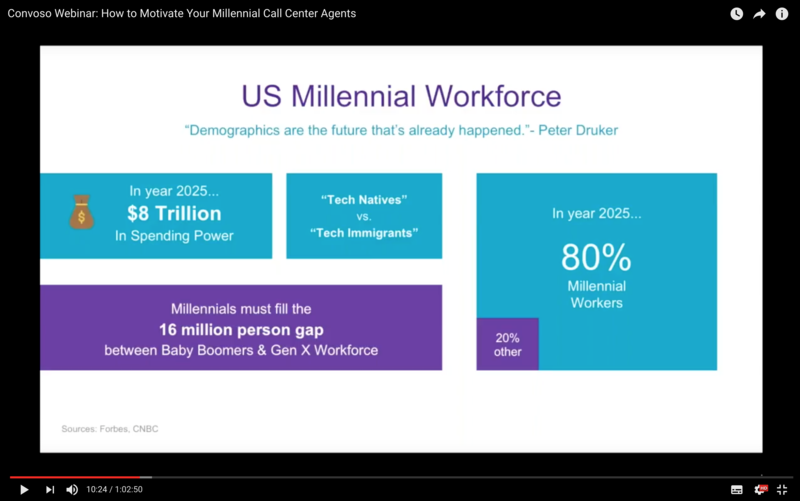 Together, they provided expert insight into practices that are guaranteed to help engage, motivate, and heighten the performance of millennial call center employees. Dr. Gustavo addressed why the topic of millennials is so important in the onset of the webinar, "There is no escaping demographics. As 84 million baby boomers leave the workforce, there are only 68 million Gen Xers to back fill those positions, creating a 16 million person gap– that only the 79 million millennials can fill. Millennials are simply born at the right place, at the right time, and in the right number, to have a career arc with tremendous growth." The webinar is an hour long and featured wide ranging questions from call center managers looking to instill a new culture within their call center. Follow the link below so you can watch the free webinar today! Miss out on the webinar's live Q&A? No fear! Feel free to email any questions you have regarding how to best manage your call center team to marketing@convoso.com. Just be sure to use "webinar question" in the subject line.